24x7 Help by PCRx.com, LLC - Boost Your PC. 24x7 Help is a software/call service that provides via an hourly charge remote users to help fix your PC. Once installed however, 24x7 Help attempts to upsell various other PCRx.com (Crwaler LLC) software products including registry and PC optimization programs. Download Boost and enjoy your PC. Remove 24x7 Help from your PC. Why should I uninstall 24x7 Help? 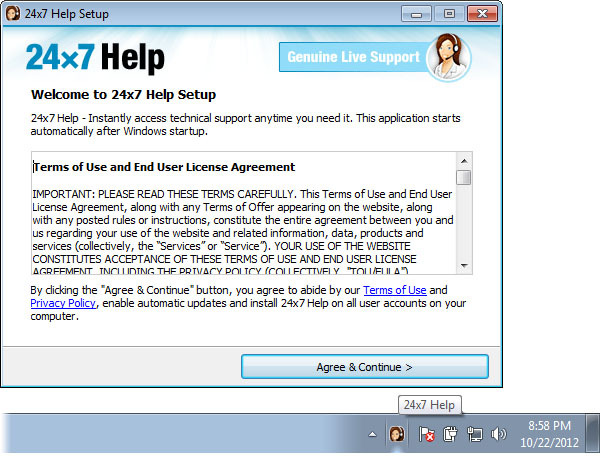 24x7 Help is typically bundled and installed with additional adware type software including web browser toolbars. In addition 24x7 Help constantly runs in the background consuming PC resources and attaches itself to the foreground programs running by adding additional features to the windows. To the right of the list item, click the Uninstall button and Boost will completely remove 24x7 Help from your PC. Use Add/Remove Programs control panel in Windows makes to uninstall 24x7 Help. Follow the appropriate instructions below to use this control panel. Select 24x7 Help from the list of programs, and click Uninstall. Alternatively, right-click the program and select Uninstall. Select 24x7 Help from the program list, and click Uninstall. Alternatively, right-click the program and select Uninstall. Select 24x7 Help from the list of programs and click Remove. Boost helps you remove 24x7 Help by PCRx.com, LLC and clean your PC.